Accuride International introduces Model 38EL - sliding hardware with an integrated low-voltage electronic lock, and Model 10EL, a stand-alone low-voltage electronic lock. These products are designed to secure drawers, doors, and other openings. Santa Fe Springs, CA - Accuride announces two new security hardware products featuring low-voltage electronic locking technology: a ball bearing slide with an integrated lock and a stand-alone lock. These products offer the industry easy-to-install, yet advanced methods to secure and control access to openings in a wide range of industrial applications. Both components are compatible with a variety of activation methods and may be incorporated into existing systems. Model 38EL is full extension slide with an integrated electronic locking mechanism. This compact product eliminates the need to install add-on locking mechanismssaving time and increasing productivity while reducing components, sourcing time, and inventory management. Model 38EL has a 100-pound load rating. The combined slide and integrated locking device occupy a standard 1/2" side space. This product is available in even lengths from 14" to 28". Model 10EL is a stand-alone electronic lock that may be used to secure doors and other openings. It has an attached installation jig devised to locate the lock and catch positions. This speeds and simplifies installation. The lock mechanism (integrated and stand alone) withstands up to 150 pounds of force and includes a provision to install a manual override. 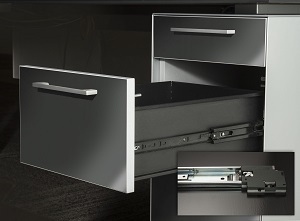 There are two locking options: Lock/Unlock, which requires manual opening; and Kick-Out, which upon lock release, propels the drawer or door open 1 to 2 inches. The mechanism provides sensor feedback to indicate open or closed status and locked or unlocked status. These products are compatible with a number of third-party components and systems to facilitate activation and integration. Possible activation methods include (but are not limited to): keypad transmitter, RFID and proximity devices, or biometrics.